Learn a variety of techniques to connect, read, and write data, including serialization, deserialization, and more. In part 1, I introduced some classes, such as DataTable, DataColumn, DataRow, and DataView, and I also explained how to use some methods and properties. In this article, I will introduce other aspects we'll be working with, such as the DataRelation and DataSet classes, constraints, serializing, and deserializing and more with through a simple application using the Visual Basic language. I'm also assuming you know a bit about relational databases. 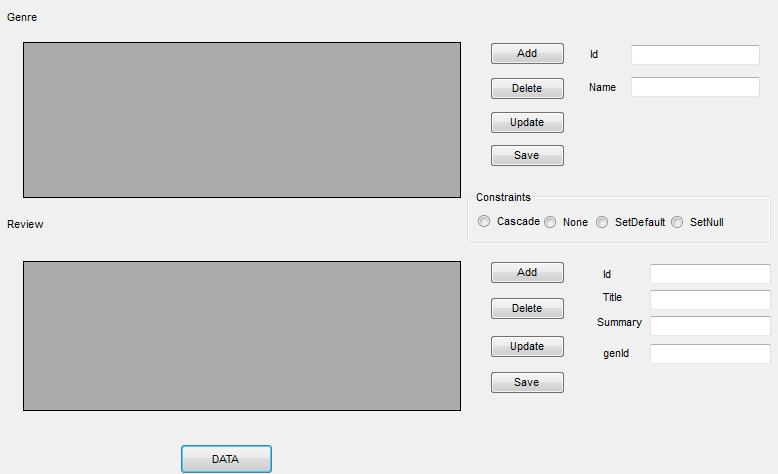 OK. Now we have the DataSet, which contains two tables, and we have also connected the tables with the DataRelation object. Default. Deletes or updates the child DataRow objects when the DataRow object is deleted or its unique key is changed. This is the default behavior. Throws an InvalidConstraintException if the parent DataRow object is deleted or its unique key is changed. Sets the foreign key column(s) value to the default value of the DataColumn object(s) if the parent DataRow object is deleted or its unique key is changed. Sets the foreign key column(s) value to DBNull if the parent DataRow object is deleted or its unique key is changed. The following code and figures will demonstrate the rules in my application. Let’s looks at the tables with Cascade rule. The tables are connected with SetDefault rule, and when I click the Delete button to delete the row that has Id = "01" of the Genre table, the rows of Review table related to this row are also changed at the genId column. The tables are connected with the SetNull rule, and when I click the Delete button to delete the row that has Id ="01" of the Genre table, the rows of Review table related to this row are also changed at the genId column. In this article, I have introduced DataSet, DataRelation , and some techniques such as serializing and deserializing. You can download the full source code of my application here. I hope you find my article helpful!